When Andres Garcia came to Carey eight years ago, he didn't speak English. Now, he's Carey School valedictorian and college-bound to study pharmacology. Garcia earned his way to college by getting good grades. He's set to attend Idaho State University in Pocotello this fall on several scholarships, including the Idaho Promise B Scholarship, available to Idaho and U.S. citizens, and a scholarship from the Idaho Mountain Express. In his application to the Express, Garcia wrote that he wants to become a pharmacist to help provide for his family, both the one he has now and one in the future. "I watched my dad work hard out in the fields for us every day," Garcia wrote. "This made me realize that that was not the job my dad wanted, and that being inside the house all day was not what my mom wanted, either. Neither my mom nor dad minded it because they did it for us. "All this encouraged me to learn English faster and to get good grades so my parents' efforts would not be wasted. This has been my main motivation ever since that time, to succeed in school." Garcia has done farm work himself, but realized it means long hours of work at low pay. "All my high school years up to now I have been doing my best at every subject I have taken," Garcia stated. "With this education, I will not only be able to help my family, but also my community." Garcia finished at the head of his class with a 3.894 grade point average. 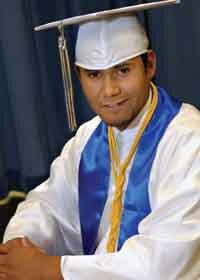 He, along with 16 other Carey students, graduated at a ceremony on Thursday, June 9, at Carey School. According to Principal John Peck, all 17 grads have applied to and been accepted into college.